Keeping with this project, led by Dr Lesley Hardy with the considerable help of Dr Ellie Williams, also from CCCU, Dr Andrew Richardson (Canterbury Archaeological Trust) and Beverly Andrews, Project Manager, I thought I would bring to your attention the exhibition that will be launched on Thursday 21 February and thereafter will be open to the public. This exhibition, ‘Finding Eansythe: the Life and Afterlife of an Anglo-Saxon Saint’, will be held at the Sassoon Gallery, Folkestone Library, 2 Grace Hill, Folkestone, so please do think about going along to find out what the project team and their many volunteers have uncovered. 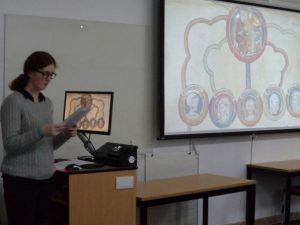 Turning now to Abby Armstrong’s paper at the CCCU History seminar on Tuesday evening, her audience comprising staff, postgraduates and the public were treated to a fascinating exposition of Eleanor of Provence’s jewel account for the years 1256–1264 [41st to 48th years of Henry III]. As Abby said, for the mid-13th century the level of detail recorded is exceptional because not only did the clerk record the date when a ring was given to a named recipient by Henry III’s queen, but the type of ring ie which precious stone and its cost were similarly noted. Furthermore, this document, produced by the queen’s wardrobe as part of an internal royal audit, records how many rings remained at the end of the year, as well as whether certain rings were to be melted down to make something else by Andrew the goldsmith. 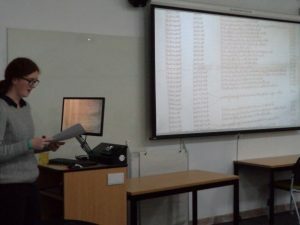 Abby began by showing her audience what the account looks like, and how she has begun to analyse all the information it contains by entering the details into an Excel spreadsheet. This method has given her data on the rings: total number, number in any of these years, distribution of precious stones, costs etc. For example, the 44th year of Henry III witnessed the greatest number of rings purchased at 382. Abby thinks that the fact that no more rings were purchased after the end of 46 Henry III, even though those held by the wardrobe continued to be distributed thereafter, can be put down to the king being hampered by financial difficulties due to baronial opposition that became open revolt in 1264–5. Other interesting information she has gleaned include 1048 as the grand total of all the rings in the account, the most expensive being an emerald ring which cost £20 (this is £14,500 in today’s money). It wasn’t given away but kept in the wardrobe! However, this is unusual and only 122 were worth over £1, most 6s and under. Interestingly, 248 remained in the queen’s wardrobe, 19 were kept for the queen’s use, another 58 went to Andrew the goldsmith, leaving 723 that were distributed. Moreover, Abby has found 530 individual recipients, with 27 people receiving more than one ring. Emeralds were the most ‘popular’, with rubies not far behind, while other stones included diamonds, sapphires and garnets. As you can imagine, Abby believes this account will reveal far more as she continues to study it, so she sees this as ‘work in progress’. 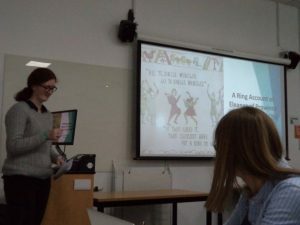 Nevertheless, she has done some exciting analysis already regarding rings and gift-giving with respect to female agency, which has allowed her to discuss how queens deployed power. For, as she said, kings and men generally have been viewed by historians as exercising ‘hard’ power whereas queens are said in the historiography to deploy ‘soft’ power. Recently, however, this divide along gender lines has been challenged by scholars such as Professor Lindy Grant and Abby, through the jewel account, believes she has further evidence that similarly demonstrates that queens were employing the same strategies as their male relatives. Thus, for example, women were using patronage – gift-giving, in the same way as men. Furthermore, they not only undertook this directly but also by proxy, ie they gave rings to another woman who would then distribute them, which could greatly extend benefactor-beneficiary or patron-client relationships. As someone who has worked on gift-giving and reciprocity in the field of hospital patronage, I can confirm that such ideas were not confined to the nobility in the Middle Ages, being equally understood and pursued by those further down the social scale. To return to a couple of Abby’s examples, I’m going to touch on the way Queen Eleanor instructed her daughter Beatrice in the art of diplomatic patronage because it shows that Beatrice was not merely a pawn in the royal marriage game. As Abby discussed, Beatrice is especially interesting because she was educated by her mother at court, her first gift-giving being a brooch that Eleanor gave to her daughter to give to her nurse when the princess was 10-years old. As she grew older, she similarly dispensed such largesse up the social scale, but of much greater account was the queen’s request that Beatrice receive 8 rings whilst in Paris during the final negotiations surrounding her proposed marriage to John of Brittany. Of these rings, Beatrice gave 4 to her future Breton relatives, the most expensive, a £4 ruby ring, going to the duke of Brittany, but probably as a way of helping to secure specific lands for her dower, the next most costly at £2 17s 2d was given to the king of Navarre, to persuade him to release these same lands. And to help the process along, Eleanor herself gave the Navarrese king a ruby ring costing £4. Nor was this Eleanor’s final deployment of rings on her daughter’s behalf, for she provided Beatrice with further rings on several occasions, including those that the married Beatrice should dispense when she later went to her husband’s domain in Britany. Nor was it solely her daughters and daughter-in-law who received such opportunities to undertake gift-giving through Eleanor because she also deployed her female relatives. Among such recipients was Isabella de Fiennes, Eleanor using her as a conduit in order to secure foreign knights. Thus, as early as 1259, Eleanor apparently saw the potential of the 37 rings she granted to Isabella to help to raise Flemish forces through Isabella’s further gifting of these rings. 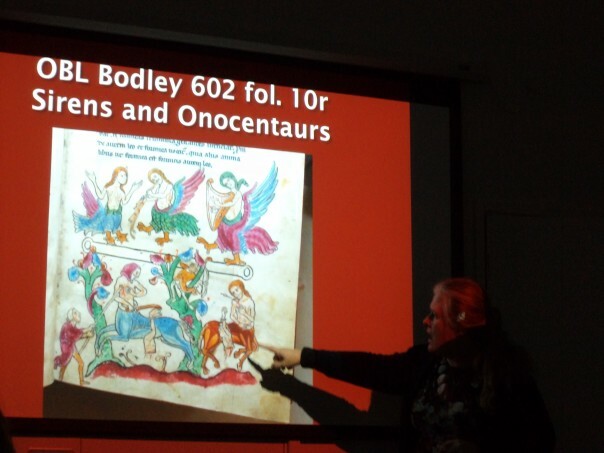 Abby’s paper raised some very interesting questions from her audience and a lively discussion ensued before Professor Louise Wilkinson, who had been chairing the session, drew it to a close, Abby and some of her peers heading off to the pub to celebrate her paper. 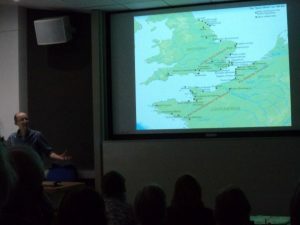 My second report will be shorter, but this is no reflection on Dr Steve Willis’ equally fascinating talk about Roman Lympne to a packed lecture theatre for the January seminar jointly run by the Centre and the Friends of Canterbury Archaeological Trust [FCAT]. 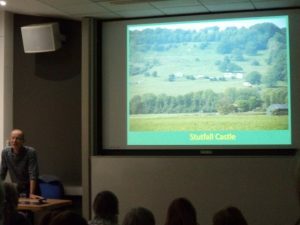 Steve offered an analysis of what has been discovered through several archaeological excavations and other studies of Stutfall Castle, one of the Saxon Shore forts, and the surrounding area, from Dymchurch in the west to Shepway Cross in the east. Such studies started in the 1850s by Charles Roach Smith, who amongst other activities was an important collector of Roman pottery, with the last major excavation taking place in the mid-1970s under the direction of Professor Barry Cunliffe. This is not to say nothing has happened since then, and Steve discussed several smaller explorations in the larger area, including digital and geophysical surveys, field walking, and small excavations. Indeed, in 2018 the local group, SHAL undertook a week of work in the Lympne area. Nevertheless, even with this level of scholastic interest there are still more questions than answers, for it has yet to be established when and by whom the fort was built, and whether it was done as a single build, although the design may point to this because there is apparently no evidence the builders changed the design at all during construction. Of course, one of the difficulties is that the fort has been slipping down the hill for centuries and added to this the actual number of small finds from the site and surrounding area is small compared to what might be expected. Moreover, such finds might be said to suggest contradictory dates for the fort, the coins suggesting a later date than the presence of Samian ware. Thus, are we looking at a late 1st century-early 2nd century fort, or one from a century later? The jury would appear to be out on this one. Among the intriguing finds discovered over the last 150 years is an altar to Neptune, now on display in the British Museum according to members of the audience, which may indicate the earlier construction date. The material used to build the inner walls of the fort may similarly offer some useful clues because they comprise re-used roof tiles, ragstone, greensand, tufa, with a sea shell mortar. The presence of re-used material, it has been suggested, relates to the demolition of neighbouring Roman villas to provide these supplies, an interesting idea. Steve also considered the place of this fort within the larger picture of coastal protection on both sides of the Channel, as well as offering a possible political context for its construction. All of these issues generated an extensive discussion afterwards, and there were lots of people who wanted to ask questions, a mark of a good paper and there were people still talking to Steve as we left the lecture theatre. 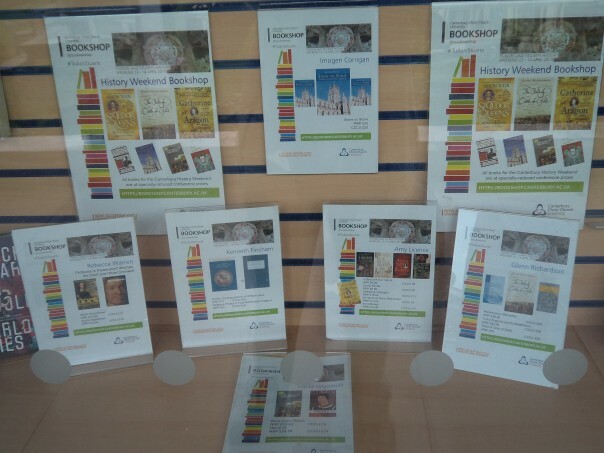 Thus, it only remains to remind readers that there are two great events coming up in March. The 5th Lambarde Lecture in Archaeology on Wednesday 20 March at 6pm at Old Sessions House will be given by Professor Stephanie Moser (University of Southampton), entitled ‘Artists, archaeology and ancient Egypt: Victorian Painters and their engagement with antiquity’; and the William Somner, 1606–1669 1-day conference on Saturday 23 March – please do come along to these and the conference timetable and tickets for Somner are available through the website: www.canterbury.ac.uk/william-somner by emailing artandculture@canterbury.ac.uk or calling 01227 782994. We would be delighted to see you.